To Cite: Barekatain B, Armanian A M, Salamaty L, Shahsanai A, Safaei A. Evaluating the Effect of High Dose Versus Low Dose Heparin in Peripherally Inserted Central Catheter in Very Low Birth Weight Infants, Iran J Pediatr. 2018 ; 28(3):e60800. doi: 10.5812/ijp.60800. Background: Although heparin may be effective in reducing risk of catheter blockage, there are several concerns about the use of heparin in patients with peripherally inserted central catheter (PICC), including decreasing platelet count and intra ventricular hemorrhage (IVH). There is limited evidence of an association between this risk and dose of heparin. According to the limited studies that have compared high dose and low dose of heparin on PICC patency and complications, this study aimed at comparing the effect of low dose and high dose heparin on central catheter patency in very low birth neonates in Isfahan, the third populated province of Iran. Objectives: The aim of this study was to evaluate the optimal dose of heparin in peripherally inserted central catheter in very low birth weight infants. Methods: This randomized clinical trial was conducted on 106 very low birth weight neonates with PICC. The neonates were divided to 2 groups, including low dose and high dose groups. The low dose group received 1.5 unit/kg/hour of heparin and the high dose group 0.5 unit heparin/1 cc of serum. The primary outcomes were the duration of time that the catheter was open and lack of occlusion. Catheter occlusion was defined as inability to push 1 cc of normal saline 0.9% with a 5 cc syringe. The secondary outcome was incidence of sepsis, catheter related sepsis, phlebitis, thrombocytopenia, skin reaction, IVH, and grade of IVH and death rate. Results: In this study, 106 neonates with mean age of 28.83 weeks participated, 43.4% of which were male. The mean duration of time that the catheter was open was similar in both low dose and high dose groups. The incidence of complications, including sepsis, thrombosis, bleeding, IVH and increasing blood pressure, were not significantly different between the 2 groups. Conclusions: This study suggested that using low dose of heparin is as effective as high dose heparin in reducing catheter occlusion and improving catheter patency and it is better to administer low dose heparin in neonates, who had central catheter to maintain its patency. Prolonged vascular access is vital for preterm neonates (1). Total parenteral nutrition (TPN) is used in neonates at the neonatal intensive care unit (NICU) to optimize their nutrition (2). Prescribing TPN needs a dedicated line in neonates. Peripherally inserted central catheter (PICC) is an appropriate route in most NICUs, which increases access for prescribing TPN and other medications and reduces the need for vein puncture (3, 4). This method is associated with lower risk of infection and pneumothorax in comparison with other surgical methods (5). There are 2 different complications for PICC in neonates, including catheter blockage and sepsis (6). Previous studies have demonstrated that using heparin in TPN could decrease the risk of catheter infection, and other systematic reviews have reported the efficacy of heparin in decreasing catheter occlusion (7, 8). In a study on neonates with central catheters, using heparin caused less catheter occlusion and greater duration of catheter patency (9). There is also other evaluations that have not shown any effectiveness for the use of heparin in reducing incidence of catheter occlusion in comparison to the placebo (10). Although heparin may be effective in reducing risk of catheter blockage, there are several concerns for its use in patients with PICC, including decreasing platelet count and intra ventricular hemorrhage (IVH) (11-13). Studies have illustrated that heparin could increase the risk of IVH yet there is limited evidence for the association between this risk factor and dose of heparin (14). According to the limited studies that have compared high dose and low dose of heparin on PICC patency and complications, this study aimed at comparing the effect of low dose and high dose heparin on central catheter patency in very low birth neonates in the third populated province of Iran. This study was a randomized clinical trial with a registration number IRCT code, which evaluated the effect of high dose versus low dose heparin in peripherally inserted central catheter in very low birth weight infants, who were hospitalized at Alzahra and Shahid Beheshti hospital, affiliated to Isfahan University of Medical Sciences (IUMS) since in 2016. The inclusion criteria were as followed: 1, having birth weight of ≤ 1500 grams; 2, having experienced PICC placement; and 3, parent’s willingness to participate in this study. If the PICC was at a wrong site and there was no chance to correct it, the cases were excluded from the study. An informed consent was obtained from the patient’s parents. With confidence level of 95% and test power of 80%, the sample size was determined for each group as 36. Overall, 106 very low birth weight neonates with PICC were analyzed (Figure 1); 53 in the low dose group and 53 in the high dose group. The infants were randomly allocated to either the low dose or high dose group by the simple randomization method, using a table of random numbers. After selecting participants, they were divided to 2 groups. In the first group, 2 fr silicone catheter (Vygon®, Germany) was placed and then confirmed using radiography. After that, 1.5 unit/kg/hour of heparin with dextrose solution was infused for neonates in the first group (15). In the second group, the same catheter was placed and 0.5 unit/1 cc of serum heparin with dextrose solution was infused (7). Catheter placement was done by sterile and standard methods. If radiography showed inappropriate site for the catheter, it was corrected and if there was no chance to correct its site, the neonate was excluded from the study. The external part of the catheter was sterile and transparent, and if this cover got wet or dirty, it was changed. Obtaining blood samples and injection of hematological products was forbidden through this PICC. The time of catheter discharge was determined by a neonatologist that assisted this study. Before the intervention, demographic data were extracted from patient’s medical records. The primary outcomes were the duration of time that the catheter was open and lack of occlusion. Catheter occlusion was defined as inability to push 1 cc of normal 0.9% saline with 5 cc syringe in (each) 24 hours. The secondary outcome was incidence of sepsis, catheter related sepsis, phlebitis, thrombocytopenia, skin reaction, IVH and grade of IVH, and death rate. Sepsis was diagnosed based on clinical manifestation and positive blood culture, without considering the results of catheter culture. Catheter-related sepsis was defined as positive blood culture from peripheral and catheter blood sampling with the same microorganism. Phlebitis was defined as skin swelling and color change accompanied by inflammation. For evaluating thrombocytopenia, the platelet counts were calculated before catheter placement, 72 hours and 10 days after heparin infusion. The IVH was evaluated by sonography on the 3rd, 14th, and 21st day after heparin infusion and the severity of IVH was defined as follows: grade I is bleeding that occurs just in the germinal matrix, grade II bleeding also occurs inside the ventricles yet there is no ventricular dilatation, grade III is bleeding that involves enlargement of the ventricle by the accumulated blood, and grade IV is bleeding that extends to the brain tissue around the ventricles with any degree of intra-ventricular hemorrhage. Neonate’s blood pressure was calculated every 6 hours and recorded in their medical records. The cause of catheter removal and death rate was calculated in both groups. All data on the neonates, including gestational age, gender, weight, time of patency of catheter, having or lack of hemorrhage, hemorrhage severity, blood pressure, and other complications were recorded in special forms already developed. The differences between groups in quantitative variables was determined by the T-student test, and for qualitative variables, chi-square was used. All statistical analyses were performed using the SPSS version 22 software (SPSS crop., Chicago, IL, USA). A two-sided α level of 0.05 was used to assess statistical significance. This article was extracted from a research project conducted at Isfahan University of Medical Sciences, Isfahan, Iran (code: IR.MUI.REC.1394.1.142). Study Review Board of the university approved the written protocol and informed consent was obtained from all the parents prior to the study. The mean age of participants in the high dose group was 28.41 ± 2.31 weeks and in the low dose group was 29.24 ± 2.76 weeks and this difference was not statistically significant (P value = 0.19). The mean birth weight was 1035.94 ± 260.74 and 1062.64 ± 250.42 grams in high dose and low dose groups, respectively (P value = 0.95). About 43.4% (n = 24) of neonates in the low dose group and 41.5% (n = 22) of neonates in the high dose group were male, and gender distribution in both groups was not statistically significant (P value = 0.60). The mean time duration of catheter patency was 15.50 ± 8.61 and 14.64 ± 9.09 days in the high dose and low dose groups, respectively, and this different was not statistically remarkable (P value = 0.73). Removing catheter in 26.4% (n = 14) of neonates in the high dose group was because of a lack of catheter patency and in 58.5% (n = 31) was because of finishing treatment; and this prevalence in the low dose groups was 22.6% (n = 12) and 60.4% (n = 32), respectively (P value = 0.89). None of neonates in the high dose group and just one neonate in the low dose group showed high blood pressure during the intervention (P value = 0.31). About 15.1% (n = 8) of neonates in the high dose group and 17% (n = 9) in the low dose groups died during the study, yet death rate was not statistically different between the 2 groups (P value = 0.79). Table 1 shows the distribution of variables evaluated in this study in both high dose and low dose groups, in details. In this study, 106 neonates with PICC were evaluated for the effects of low dose and high dose of heparin on catheter patency and occlusion. The mean time duration of catheter patency was similar in both low dose and high dose groups and also the incidence of complications, including sepsis, thrombosis, bleeding, IVH and increasing blood pressure, had no significant differences between the 2 groups. There are various studies that have evaluated the effect of heparin on catheter occlusion in comparison to placebo. In a Cochrane study, using heparin reduced catheter occlusion and increased catheter patency (16). Several researches have illustrated that using heparin for decreasing catheter complications and increasing catheter patency is beneficial. In one study, heparin was used in patients with central catheters and it was illustrated that heparin could significantly decrease the incidence of thrombosis and catheter occlusion (17). Almost all researches on the effect of heparin on catheter patency compared use of heparin and placebo together and this study may be the first study that compared the effect of low dose and high dose heparin on catheter patency in neonates. One study on 60 neonates, catheter removal due to termination of treatment was greater in neonates, who received low dose of heparin (0.5 unit/mL) in comparison to placebo (6). In another study on 100 neonates, using 0.5 unit/kg/hour of heparin improved catheter patency in comparison to placebo in patients, who had PICC (18). Other evaluations reported that using low dose heparin in comparison to placebo could significantly decrease catheter occlusion and the effect of this dose is likely similar to higher doses (19). In another study, 0.5 unit/kg/hour of heparin was effective in prolongation of catheter usability in neonates without presenting any major complications (16). Most studies evaluated low dose of heparin and it is still unknown whether greater dose of heparin is useful or not, and limited guidelines have suggested that the optimal dose of heparin in neonates with central catheter is 0.5 to 3.5 unit/kg/hour. American College of chest physician evidence based clinical guideline suggested the use of heparin at mean dose of 1.5 unit/kg/hour in infusion for maintaining central catheter patency (15). Although several studies demonstrated the efficacy of heparin in increasing catheter patency, there are other studies, which have shown that heparin had no beneficial effect in improving catheter patency. In a study that compared the effects of heparin and placebo on catheter patency, there was no differences between groups and 26% of patients in the heparin group and 16% of patients in the placebo group had experienced catheter occlusion (10). Activation of factor X was a stage that limited the velocity of blood coagulation, which is involved in both internal and external pathways. Low dose of heparin combines with anti-thrombin III and inhibits conversion of prothrombin to thrombin by inactivating the X factor. After thrombus formation, high dose of heparin inhibits converting fibrinogen to fibrin, and prevents other thrombus formation. In addition, heparin prevents stable thrombus formation by inhibiting activation of factor XIII (20). The effect of heparin in neonates is lower than adults due to the lower level of anti-thrombin III. The clearance of heparin in neonates is lower than infants and adults and the half time of heparin in neonates is around 1 to 3 hours (21). Generally, benefits of heparin should be weighed against major risks associated with its use, such as aggravation or causation of hemorrhage (14). 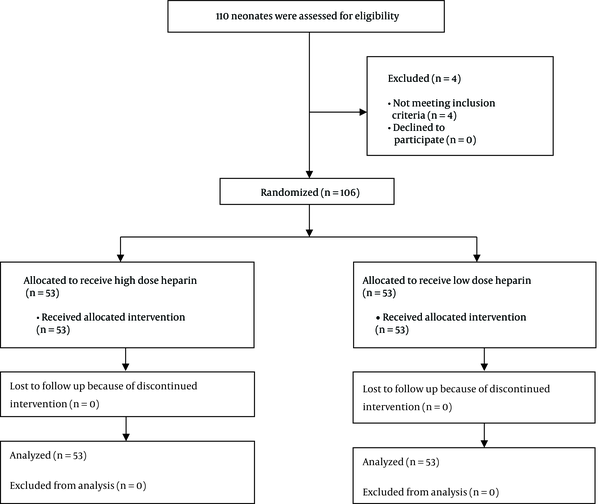 According to the results of this study, which showed no differences between using low dose heparin in comparison to high dose heparin, this study suggested that it is better to administer low dose of heparin in neonates with PICC, which has appropriate efficacy for catheter patency and prevents catheter occlusion with less complications. This study was the first study that compared the effects of low dose and high dose of heparin, although most previous studies compared using heparin and placebo. One of the limitations of this study was related to the sample size, which was too small to be generalizable to the entire community, and further studies should be conducted with larger sample sizes. In this study, other factors, such as underlying disease and other variables that affected these outcomes were not considered and better evaluation with better planning is needed. Using low dose heparin is as effective as high dose heparin in reducing catheter occlusion and improving catheter patency. This study suggested that it is better to administer low dose heparin in neonates, who had central catheter to maintain its patency. Further studies for evaluation of complications induced by heparin are recommended. The current paper was conducted with support of the research deputy of Isfahan Medical School. Kind supports of respective people are highly acknowledged. Declaration of Interest: The authors declare no conflict of interest. This study was supported by the Isfahan University of Medical Sciences (grant: 194142). Funding/Support: The study was sponsored by Isfahan University of medical sciences. 1. Chathas MK, Paton JB, Fisher DE. Percutaneous central venous catheterization. Three years' experience in a neonatal intensive care unit. Am J Dis Child. 1990;144(11):1246-50. [PubMed: 2239866]. 2. Sketch MH, Cale M, Mohiuddin SM, Booth RW. Use of percutaneously inserted venous catheters in coronary care units. Chest. 1972;62(6):684-9. doi: 10.1378/chest.62.6.684. [PubMed: 4635417]. 3. Mahieu LM, De Muynck AO, Ieven MM, De Dooy JJ, Goossens HJ, Van Reempts PJ. Risk factors for central vascular catheter-associated bloodstream infections among patients in a neonatal intensive care unit. J Hosp Infect. 2001;48(2):108-16. doi: 10.1053/jhin.2001.0984. [PubMed: 11428877]. 4. Aggarwal R, Downe L. Use of percutaneous silastic central venous catheters in the management of newborn infants. Indian Pediatr. 2001;38(8):889-92. [PubMed: 11521000]. 5. Moureau N. Neonatal and pediatric peripherally inserted central catheters basic manual. Ecouen, France: VYGON Corporation; 2005. 6. Kamala F, Boo NY, Cheah FC, Birinder K. Randomized controlled trial of heparin for prevention of blockage of peripherally inserted central catheters in neonates. Acta Paediatr. 2002;91(12):1350-6. doi: 10.1111/j.1651-2227.2002.tb02833.x. [PubMed: 12578294]. 7. Moclair A, Bates I. The efficacy of heparin in maintaining peripheral infusions in neonates. Eur J Pediatr. 1995;154(7):567-70. doi: 10.1007/BF02074836. [PubMed: 7556325]. 8. Appelgren P, Ransjo U, Bindslev L, Espersen F, Larm O. Surface heparinization of central venous catheters reduces microbial colonization in vitro and in vivo: results from a prospective, randomized trial. Crit Care Med. 1996;24(9):1482-9. doi: 10.1097/00003246-199609000-00009. [PubMed: 8797619]. 9. Upadhyay A, Verma KK, Lal P, Chawla D, Sreenivas V. Heparin for prolonging peripheral intravenous catheter use in neonates: a randomized controlled trial. J Perinatol. 2015;35(4):274-7. doi: 10.1038/jp.2014.203. [PubMed: 25474552]. 10. Betremieux P, Odent S, Prigent J. Study of continuous infusion of low doses of heparin in the prevention of complications of catheters during the neonatal period. Rev Pediatr. 1988;7:311-5. 11. Chang GY, Lueder FL, DiMichele DM, Radkowski MA, McWilliams LJ, Jansen RD. Heparin and the risk of intraventricular hemorrhage in premature infants. J Pediatr. 1997;131(3):362-6. doi: 10.1016/S0022-3476(97)80059-5. [PubMed: 9329410]. 12. Warkentin TE, Levine MN, Hirsh J, Horsewood P, Roberts RS, Gent M, et al. Heparin-induced thrombocytopenia in patients treated with low-molecular-weight heparin or unfractionated heparin. N Engl J Med. 1995;332(20):1330-5. doi: 10.1056/NEJM199505183322003. [PubMed: 7715641]. 13. Malloy MH, Cutter GR. The association of heparin exposure with intraventricular hemorrhage among very low birth weight infants. J Perinatol. 1995;15(3):185-91. [PubMed: 7666265]. 14. Lesko SM, Mitchell AA, Epstein MF, Louik C, Giacoia GP, Shapiro S. Heparin use as a risk factor for intraventricular hemorrhage in low-birth-weight infants. N Engl J Med. 1986;314(18):1156-60. doi: 10.1056/NEJM198605013141805. [PubMed: 3960090]. 15. Monagle P, Chan AKC, Goldenberg NA, Ichord RN, Journeycake JM, Nowak-Gottl U, et al. Antithrombotic therapy in neonates and children: Antithrombotic Therapy and Prevention of Thrombosis, 9th ed: American College of Chest Physicians Evidence-Based Clinical Practice Guidelines. Chest. 2012;141(2 Suppl):e737S-801S. doi: 10.1378/chest.11-2308. [PubMed: 22315277]. 16. Shah PS, Ng E, Sinha AK. Heparin for prolonging peripheral intravenous catheter use in neonates. Cochrane Database Syst Rev. 2002;(4). CD002774. doi: 10.1002/14651858.CD002774. [PubMed: 12519576]. 17. Randolph AG, Cook DJ, Gonzales CA, Andrew M. Benefit of heparin in peripheral venous and arterial catheters: systematic review and meta-analysis of randomised controlled trials. BMJ. 1998;316(7136):969-75. doi: 10.1136/bmj.316.7136.969. [PubMed: 9550955]. 18. Shah PS, Kalyn A, Satodia P, Dunn MS, Parvez B, Daneman A, et al. A randomized, controlled trial of heparin versus placebo infusion to prolong the usability of peripherally placed percutaneous central venous catheters (PCVCs) in neonates: the HIP (Heparin Infusion for PCVC) study. Pediatrics. 2007;119(1):e284-91. doi: 10.1542/peds.2006-0529. [PubMed: 17200252]. 19. Ankola PA, Atakent YS. Effect of adding heparin in very low concentration to the infusate to prolong the patency of umbilical artery catheters. Am J Perinatol. 1993;10(3):229-32. doi: 10.1055/s-2007-994726. [PubMed: 8517902]. 20. Blauhut B, Necek S, Kramar H, Vinazzer H, Bergmann H. Activity of antithrombin III and effect of heparin on coagulation in shock. Thromb Res. 1980;19(6):775-82. [PubMed: 7466746]. 21. Rennie JM, Kendall G. A Manual of Neonatal Intensive Care. Fifth ed. CRC Press; 2013.